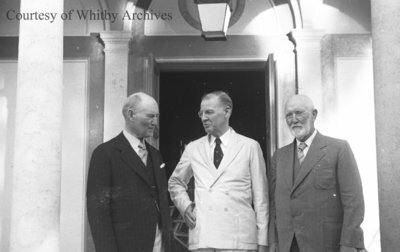 A black and white negative of Colonel J.B. Maclean, Sir Robert Falconer and Sir Joseph Flavelle standing outside of a building in West Palm Beach, Florida. In this view Sir Robert Falconer has his hand on his hip and is talking to Colonel J.B. Maclean. Marion Rowe, January 1938, Marjorie Ruddy. Whitby Archives A2013_040_662D.